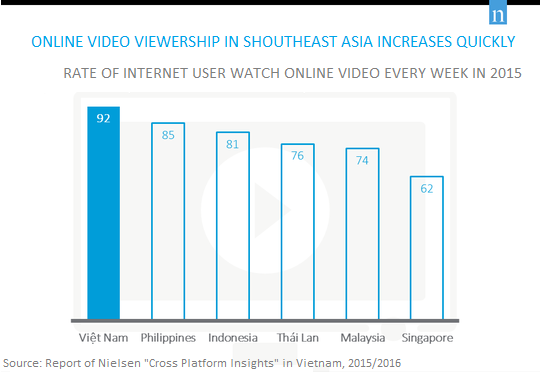 Nielsen research has shown that online video viewership in Southeast Asia is exploding and Vietnam is at the tip of this trend! Online video is going on growing and diversifying. comScore’s report “Digital Future in Focus: Global Trends and Insights” (June, 2016) found that the digital video experiences is experiencing further fragmentation on a global level. “Younger users continue to account for the majority of desktop video views but 55+ users consume more minutes per video, suggesting a greater number of long-form video for this demographic. The report found that whilst the total number of videos consumed has continued to rise, the average duration has declined due to more widespread short-form content and the growth of video advertising. Interestingly, advertising minutes form a smaller percentage of younger users’ total video time than for older demographics, suggesting there are still reach older audiences effectively via engaging video advertising formats. Video and TV content consumption is shifting online and fast. For advertisers there is a great opportunity to use this to capture and engage existing and potential customers in far more efficient ways. If you’re still wonder how you can maximize ROI of your next campaign, please don’t hesitate to get in contact with us here, Our team are ready to help!